Let me first start off by saying I need MACs matte Ruby Woo in my life. I have heard so many good things and it looks gorgeous. This was the colour I sent off in my giveaway and it hurt so much to send as I secretly wanted to keep it for myself! All the other items are from Topshop. Went a bit overboard. A very black, silver and monochrome appearing wishlist. I'm in dire need of a new purse and the one above is so different to anything I have ever owned before. And I have come to realise a JUMPSUIT is a must for my wardrobe! It's my birthday around the corner and this would be so perfect for a big meal I am going to have, along with the silver jewelry. There were actually too many jumpsuits I liked also on Missguided. Another thing. I need to get hold of some midi rings. They seem to be everywhere how do I not own any? My fingers have felt so bare lately. I think everyone needs MAC Ruby Woo in their life! 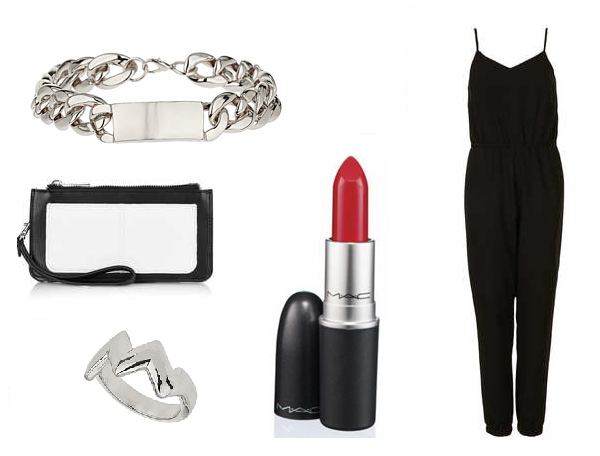 I love the jumpsuit too, as its black it would be lovely for a alternative evening look! I really need some midi rings too and that jumpsuit is also really nice! I know, really into it at the minute. Tell me about it, maybe I should hint to the boyf. Same, I will invest it when I get paid again. So excited.